I travelled half way around the world recently to reconnect with friends on the island known as Martha’s Vineyard south of Cape Cod Massachusetts. I was amazed to learn that there is no Martha and there is no vineyard. How could this be? There is one theory indicating at one time native wild grape vines covered the island. One of the earliest settlers was called Martin so it’s possible that over time Martin’s vineyard morphed into Martha’s Vineyard. My friends fell in love with the island some thirty years ago and built a holiday house on an idyllic for their family spot. They followed the local tradition of building post and beam structures clad in clapboard siding and shingles. The structures relate beautifully with the muted colours of the surrounding seaside landscape. Knowing my keen interest in art my host booked me a place with his life-drawing group. Great idea. I appreciated the opportunity of linking up with some of the other local artists. My supply of paper is limited. I must accommodate numerous figures on a page instead of drawing just one figure. The model disrobes there in front of me, naked, moving easily to strike a pose. Self assured moving from one two-minute pose to the next. It’s all about balance and dynamic tension, subtle shifts of weight, realignment of the shoulders, a turn of the head and a twist of the torso. Reclining on cushions for a longer pose the body takes on a languid air. Good lighting creates highlights, shadows and drama. I move my charcoal rapidly over the page each image having sufficient detail to catch the eye. One sketch finishes another starts images flow into each other. My mind free from distraction senses the sculptural qualities of the figure before me. Capturing the essence of the pose extends my observational skills as well as eye/hand co-ordination. 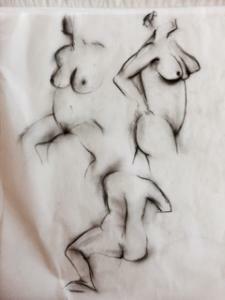 The many figures on the paper become a tangle of torsos imbued with feeling. The model is a mature woman lots of curves and I go with the delightful flow of her body. Models are often the best timekeepers. Knowing when to move to a different pose is a skill in itself. Short poses a really warm- up exercises just to get your eye in. Longer poses make physical demands on the model to keep still being relaxed but not so relaxed that sleep beckons. Standing by my easel at the back of the room I am aware of others in the group bent over their drawing boards presenting me with a picture of intense concentration. A discussion ensued. We were able to talk about each other’s technique, she uses a lead pencil while I use charcoal. Her drawings are of the complete figure small yet detailed, my drawings focus on parts of the figure significant to the pose rendered in strong flowing lines. On the way home I chatted with my friend and learnt that he had kept folios of his work over the past few years. Keeping drawings enables critical analysis to discover what works well and what can be improved. 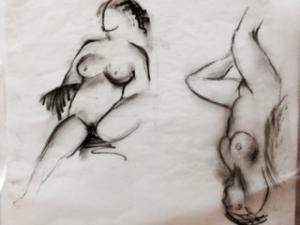 There is nothing quite like the practice of drawing with a live model. Although the time is short a relationship builds between artist and model, few words are spoken. For the brief time spent together both artist and model in different fashion bare their souls. The moving figure captured in the moment.